I would like to ask for help with my sourdough breads. Even if the dough looks nice after kneading, it becomes extremely loose (sometimes even liquid) during the fermentation. And in times it is possible to handle and somewhat shape, it becomes completely flat during proofing. I have my second starter now. My first starter produced wonderful breads, I never experienced any big problems. But the one that I started after the Days od Unleavened Breads is really strange. I keep it the same way - 60% hydration, 20% whole rye, 80% white flour, feeding every 12 hours and it rises very well. It happens only when the bread is pure sourdough. When I add the starter to a yeasted bread (1% fresh yeast), everything is OK. Mix, autolyse 30min, French fold 100 strokes, 10min rest, then 4 Stretch&Folds after 15minutes. Bulk fermentation 3-4hours in the kitchen (71-74°F) then overnight in the fridge. In the morning preshape - shape - proofing app 120min. The same problem happens when there is only 20% whole wheat or whole rye. Moreover when I tried to replace the white flours with KAF AP (a present form US), in the morning the dough was completely liquid. Well, that said if I do not watch the flat shape or bake in a pan, it tastes wonderful, the bread is quite light and the cumb is open. rye involves a lot of proteolitic activity, thus in few hours your flour will turn into something resembling a glue. Generally proteolisis can be kept under control adding salt already in the biga, did you try it? I usually dissolve salt in the water, then use this water to dissolve the starter and prepare the biga. When you use yeast you won't notice the effect because yeast requires much less time to raise the dough. You can also consider converting your starter to all AP, or use much less of your mixed starter to begin with (e.g make a salted biga with 10 gr and prepare the final dough when it's raised). Thanks, for you comments. I am happy to see an answer from somebody from Europe! I am also thinking of too high enzyme activity, but compared to my first starter I do not understand why. Rye? Only 10%? I did these same recipes with my first starter, following the same method. I used even 25% rye and I never had problem. When I do yeast bread with addition of the starter just for taste, I also follow the same schedule with overnight fermentation. So the time is the same as for sourdough. It is not really easy to get a very high gluten flour on regular basis here. Could you give me more details how you prepare you biga? Or an example of a recipe? at morning the biga will have raised and if all was well it won't be almost melted as you observed in your doughs: it will surely be a little softer than the night before, but still kneadable. Dissolve this biga in the salted water of the final dough and add the rest of the ingredients. Generally I use 1/4 of the total flour in the biga, thus 300 more grams in the final dough. I will certainly try it. I only do not know - do you use some salt for regular feedeng as well or only when you prepare a biga for a concrete bread. I know that salt inhibits enzymes (I have already used it with soakers) , but it inhibits yeast as well, doesn´t it? So does it inhibit enzymes more than it does yeast? Have I killed my starter? I wanted to try out your trick with salt but too late I realized I put there 5g (1tsp) salt instead of 2g. It has been 16hours now and it does not seem to rise. Too much time fermenting or perhaps your flour? I concur with nicodvb. It sounds like too much enzyme activity. However, another thought is the flour. Do you home mill? I find my Nutrimill really heats up the flour unless I start with frozen/chilled wheat berries.If it heats up too much, there can be damage to the starch and this can also cause increased enzyme activity with the slackness of the dough you describe. I've also had this situation and it continued until I changed flour to a different batch.I just used the suspect flour for cakes and cookies without a problem. Also, different types of whole wheat have different types/characterisitcs of gluten. Kamut wheat has plenty of gluten but it is very extensible and you end up with freeform loaves that won't hold a shape. I have also found that my starter can sometimes acquire more liquid characterisitcs if I neglect a feeding or 2 without refrigeration.And then if I try to activate and use in bread, my dough is as you describe.The answer is to rebuild the starter using only a few tablespoons of the original, heavily discarding before the next feeding and continuing until it is back to normal.I do keep my starter at a more liquid state than you do. So a few more thoughts/ramblings on the matter. I do not have a mill. I use store-bought flours, always the same producers. But with my second starter the problem happens with any flour. What I do not understand is why the problem is now. My starter is fed quite regularly at 10g starter - 30g water - 50g flour. I use approximately the same rates when I need more starter for a concrete bread. Do you thing beginning a new starter could help? I would try this: After your mix, autolyse and folding, transfer the dough to the refrigerator. In the morning take the dough out and do one stretch and fold. After two and one half hours more at room temperature, do another stretch and fold. After thirty minutes more, divide and preshape, then shape and proof. The proofing should take anywhere from ninety minutes to four hours dependent upon all of the factors affecting proofing. Make certain of your ability to tell when dough is fully proofed. Correct proofing is the most critical aspect of all this. But I did not know it could be connected to handling with enzymes. I wonder what is the explanation behind that - why is it better to cool the dough first? It will come to room temperature later anyway and the enzymes will be activated the same way as if it was first fermented at room temperaure and then refrigerated. Sorry, I am confused. But I will certainly try!!! Try what I suggested and then let's talk about the outcome. Put simply, with your stated method, you are getting the dough completely ready for shaping, final proofing and baking but instead, it is going into the refrigerator. By the time you pull the dough out on day 2 it is, in all aspects, well past being ready for the oven. The refrigerator is slowing down the process not stopping it and you have an almost fully processed the dough before it goes in. By putting in the refrigerator right away you are slowly down and retarding the entire process before it happens. Then on day 2 it should all go as you would hope. thanks for at least a short explanation. You are certainly right now I have to try and see. Today I have already mixed the starter with salt as suggested by Nico. But I will try your method on Sunday/Monday. You can control this more effectively with Yerffej's idea. If you chill the dough immediately, and allow for a slow fermentation first, then process for final proof, you should enjoy greater success. just in case. Be careful not to contaminate it with the present starter. Use 20g Rye and 20g unsweetend pineapple juice. Keep the starters away from each other. Then in a few weeks test out the new one. It can't hurt to get a new one going. It could very well be that you have a combination producing a lot of enzymes. Maybe one of the flours contains a good amount of malt, I know that barley malt and rye are seldom combined resulting in too much enzyme action. Maybe something along those lines is happening. To find out if the problem is the sourdough starter, try taking just a small amount of starter and feeding it only one flour. Or, better yet, make three starters using your present starter. Try making a rye only, a whole wheat only, and an AP starter feeding for a few days and see if the problem clears up when comparing them in dough. If all three are affected or affect the flour the same way, then you'll be glad you started a new starter. If one flour falls apart before the others, you've got a good indication which flour is a problem. To test the flours, make firm dough balls (just flour and water or mixtures of various flours and water) label them, set them in a row, cover and watch them. If one contains a high amount of enzymes, the gluten will fall apart on its own without additional help from yeasts. - when I see my notes the breads with some rye, even as little as 10%, were more problematic than only wheat breads. Could this have a meaning? Your suggestion with 3 starters sounds interesting. I love biochemistry :-) It would take some more time but it may be worth trying. Hmmm. fed with Austrian rye flour. I also have a spelt starter that was rye at one time. So far no problems. Both kept in the fridge most of the time. Try the flour ball test and let it run 2 or 3 days. The result may or may not help. 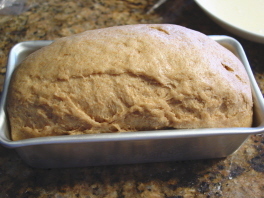 Maybe you can reduce the enzymes by refreshing the starter with baked day old bread instead of flour. A blender works miracles! That way no added fresh enzymes get into the starter and you get longer working times with the dough. I don't have a lab but I sure am the curious type. It might be worth a try. Have you already tried the thing with bread? Do you have an idea about how much starter : water : bread for how much flour? Actually here nobody keeps another starter than 100% rye. The most traditional bread in my country is 45-55% rye - all of it in the form of a sour. Well I have not dare to try yet. But I will one day. I was also amazed by you 100% rye. This is another challenge for me... BTW - how and when do you make the hole in the middle? Looks like you got your investigations ahead of you. Lots of them. I must be using a medium rye it's #960. The bread feeding? Yes, I do it all the time. Keep my mother starter with rye and refresh using rye bread. I soak it with just enough water to soften and weigh it as flour & water combined. Leave it at room temp until I like the aroma. I've never baked a challah with sourdough. I was convinced I saw the special "scoring" or rye bread in your post. Bad memory. I will have to find it again. So if I understand well: regular feeding 100% hydration rye starter with flour / water. And for preparing a starter for baking using old bread instead of flour. I have just found the link to backersuepke´s web page and your experiment, so I will read it as well. 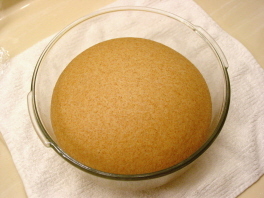 Can this starter be used for any bread? You are certainly right. I have a lot to try and to learn yet. It has been only a little more than a year that we bought a breadmaker and made our first home-made bread. And it is 5 or 6 months that I stopped using it. Thanks to TFL I prefer working by hand and baking in the oven. Thanks for help and patience! aren't enzymes unaffected by cold? Sorry, but there's something that doesn't fit with what I read previously: I thought that enzymes (and protease in particular, that is Zdenka's cause of concern in this case) were totally unaffected by cold and refrigeration. Am I totally wrong? You've had long and complex conversations with Debbie Wink on this. I'm sure she states that acidification is slowed down by use of colder temperatures. Do you not think this is significant in terms of the dough rheology we are discussing here? ps love your formula for working with the biga. Perfectly balanced; you are some baker, I must say! Since I'm not a microbiologist nor a chemistrian I'm not sure i understand Debra's explanations to the full extent. My understanding (hopefully correct) is that acidification -that as you wrote is surely slowed down by colder temperatures- is only one of the causes of the gluten deterioration, and not even the most preminent one. If I understand correctly what I read (and remember...) protease works on its own whether there's some fermentation/acidification ongoing or not, as on a parallel path. Isn't it the reason why autolyse is particularly advised when the flour is particularly high in gluten and yiealds a very elastic dough that can't be spread easily? Sorry, I don't want to spread confusion in this particularly complex matter. It's not my world and everytime I write something I'm concerned I could be writing something completely wrong. I'd say this seems right to me. Once the protein is hydrated, yes the enzymes will get to work. ...to your starter between bakes? But how often are you baking? Are you using any form of refrigeration here? thank you for all your comments. I will reply to them gradually. For my first starter I followed Dan Lepard´s instructions except for yogurt. That starter was OK. This time I tried the "pinapple solution" described by Debra Wink and SourLady on TFL. It was about 2 months ago. After the first 5 days, the starter was maintained 100% hydration, then 80% (fed 1:4:5). But I found it was ripe too early. So I converted it to 60% hydration (the same as with my first starter). The starter is fed 10:30:50 every 12 hours and kept on the cupboard. I bake 3-4 times a week (Sunday, Monday, Friday and the rest depends on the situation) so I do not put it to the fridge. Is that enough to make a diagnosis? What should I change? What was the possible cause you were thinking about if I had not bake so often? If I may ask? I also wonder what kind of enzymes are probably so active in my starter - amylases, proteases or both? I got a literally liquid dough when combining wheat T800, rye T950 with american KAF AP where barkey malt flour is added. What I do not understand why there is not a problem with yeasted breads containing the addition of the starter which I equally retard overnight. It seems like the problem is in the interaction of my starter with flour and other conditions. The enzymes come both from the flour and from the wild yeast don´t they? I will be very grateful for some explanation. A culture not maintained properly will become overly acidic. The result is that if used in a bread dough, the protein structure will break down very rapidly, and the fermentation will just..never happen! Both the dough and the shaped loaf rise well despite their more or less liquid state. Wheat levain should produce bread similar to that described by nico in the context of a white biga. In other words, mild, yet flavoursome, and utilising the strength of wheat gluten. Then to the high ryes some of us are so fond of...different animal altogether. So, I've always seen differences between rye cultures, which I call sour dough, and wheat cultures which I would refer to as leaven. Daisy, you should let you rye FULLY ferment through before use!!! A number of highly esteemed bakers on TFL use a small amount of rye flour in their formula which is not part of their pre-ferment. This is absolutely fine. For preference, I like to use the rye element as part of the pre-fermented flour. As I say, that is my preference. So what I'm saying is that your rye sour should be fully fermented. separation is the "hooch" you will see discussed on here. We shall go no further! Do you mean the Belgian Trappist Bier Daisy_A? That is my favourite Blonde Bier..ever! You'd better ask Andrew about the moonshine; he's the expert!!!! the dough looks nice after kneading, it becomes extremely loose (sometimes even liquid) during the fermentation. And in times it is possible to handle and somewhat shape, it becomes completely flat during proofing... I did these same recipes with my first starter, following the same method. I used even 25% rye and I never had problem... I use store-bought flours, always the same producers. But with my second starter the problem happens with any flour. After autolyse, I added the salt and the levain, and resumed mixing/kneading in the stand mixer. At first, it looked just like I expected---a shaggy dough that at least partly came away from the sides of the bowl. But as it smoothed out, instead of forming into more of a ball, it quickly became more fluid and sticky, settling into the bowl like a puddle of batter. I worried that I had added too much water, but I resisted adding any more flour in the mixer. Instead, I scraped the dough out onto a floured counter to see if I could bring it into a ball, I gave it a few kneads, and it was sticky and slack, but the hydration really seemed about right. It didn't take long for it to slump and flatten out in the bowl. 50 minutes later, I dumped it out for the first s&f. When I pulled the edge closest to me (what turned out to be dangerously close to the edge of the counter), it almost got away from me. Have you ever tried to pick up a slinky by grabbing just one part of it? That's what it was like. Fortunately, I caught it as it tried to sag to the floor. Except it was more like a dive to the floor, it happened so fast. Janij's description of taffy (here) is a good one. It seemed like it could stretch for miles. At the second s&f, it was only slightly better, so I decided it needed at least a third, and more fermentation time. The third time, there was some elasticity, and some puffiness, so after an extra 50 min of fermentation time, I proceeded to dividing and everthing else as given in the procedure. When I turned the loaves out of their bannetons, they stayed inflated, but started to spread immediately. My shaping must have been okay, because they rose upward in the oven, rather than spreading even more, and they came out looking not great, but better than I expected. Also, because proteolysis is enzyme-driven, it takes time to see the effects, and only gets worse. This weird stretchiness developed immediately after incorporating the levain, and elasticity actually improved a little with extra fermentation. Others were contacting me around that time with similar problems, and I ended up writing to Michael Gänzle at University of Alberta, to see if he could shed some light on what organism(s) might be doing this. Based on past work, I have encountered very few sourdough starters that are proteolytic to a point that they would alter dough elasticity, however, most organisms produce thiol compounds which depolymerise gluten and thus alter the dough structure. If you have read the milk powder thread, then you already know that thiol compounds interfere in the formation of the gluten network by blocking cross-linkage between gluten proteins. Cross-linking is what pulls the gluten together into a strong, elastic mesh. 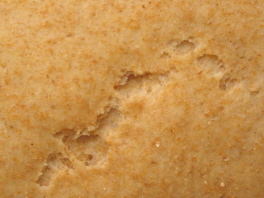 Some sourdough bacteria produce thiol compounds from peptides and amino acids containing sulfur such as glutathione, cystine or cysteine (and may throw off a cheesy or sulfury odor in the process). More people seem to be complaining of these problems lately, with starters in transition (or maybe I'm just more in tune to it now that I've experienced it first-hand). By transition I mean changing hydration, changing flour, etc., as well as new starters that haven't stabilized yet, or even established starters that have gone "off" because of underfeeding or neglect. Starting over doesn't necessarily help. What I recommend is stepping up your feeding to 3 times a day, if you can, or to a bigger feeding twice/day if you can't. Feed at peak, before it collapses. I did 5:3:5, three times a day, and when I couldn't manage at least two feedings, I parked it in the fridge to slow it down in between. It took 9 to 10 days to rid my starter of the offending organism, but the transformation was dramatic and overnight. It had been in sort of a holding pattern for 9 days, and then changed all at once, indicating to me that a new (more desirable) organism took over. It has behaved beautifully ever since, and my doughs have elasticity again. Give it a try. Debra, this is really new stuff! A question rises spontaneously: other than refreshing and stabilizing the starter as you said, is there some magical pixie dust to counterbalance thiol compounds and prevent their interference with the gluten when the starter is not in an optimal condition? Thanks a lot for dedicating us so much time, Debra! It sounds like Debra is talking about a natural by-product of certain micro-organisms. You've just provided optimal conditions for this other bug to grow better than the ones you want - so you have to tip the balance back to the ones you want, by providing nice conditions ie. nice strong healthy starter, by a regular feeding schedule. Thiol compounds are also what make "green" flour difficult to work with. Generally, the way they are disabled is through oxidation---either by letting freshly milled flour sit and age naturally in the presence of oxygen, or by adding chemical oxidizers to speed up the process. Aging isn't a solution you can use for your dough, but I suppose you could try a commercial dough conditioner mix that has oxidizers. Or adding bean flour which also oxidizes, but expect that these things will have a negative impact on flavor and crumb color. The only other thing I can think of to help improve elasticity, is ascorbic acid. But that was because I wanted a starter at 60% hydration. You should use whatever your goal hydration is, and refresh at whatever rate and frequency prevents a chronically overripe state. Two to three times a day will steady the pH and move it through the funk most efficiently, and that's why the small feeds (more starter). I found your enlightening post while looking for an explanation and solution for the problem that you address in this string. I'm having the same issues with taffy or silly putty-like dough after mixing in the levain and a rank, sulfurous odor to the starter. You've confirmed my decision to try and feed my starter back to health. My question for you is could my problem have come from only maintaining a small amount of starter - around 1/4 cup? I've wondered if there is an optimal minimum below which problems like this could develop. Thanks! First, let me say a belated "thanks" for this post, which finally led me down the right path to making sourdough bread back in 2011. I ended up just going with a known-good Carl's starter rather than fixing my own. I don't know if this is anything, but I've noticed on sick starters that I can pull much thinner strands that have a different viscosity than normal gluten strands. I know different sourdough bacteria can produce gums and that this is even something that's desirable to some degree. However, I never notice anything like this in healthy starters. My question is: is the "rope" more noticeable given the gluten breakdown, or is the level of gumminess here out of the ordinary? When I have tried to bake with sick starters in the past, sometimes the result was a decent loaf that had patchy gummy spots. I wonder if this is the cause? I realize this is quite "in the weeds" for a baking site but I would be curious to know if you or anyone else here knows. Wow -- and yuck -- that is something to see. :) Thank you for posting these videos. When I experienced thiol interference, it was in a stiff starter, so it didn't pour like that. But it was very sticky and infinitely stretchy. Perhaps the stickiness came from a gum. Don't know. Certainly a Pediococcus could have been involved. I can't give a definitive answer to your question because I'm not sure what the state of gluten is in your starter, but it's clearly more discernible in the thinner consistency. Note that thiol interferance is not the same as gluten breakdown. To contrast, proteolytic enzymes cut gluten proteins into pieces. Thiols only block gluten proteins from linking together into a strong elastic mesh. And thiols can be taken out of commission through oxidation by flour enzymes. So thiol interference is somewhat reversible, whereas proteolytic breakdown is not. Has been identified in healthy sourdough starters. In fact under a recent study done on sourdough starters some have come back with pediococcus as the main lactic acid producing bacterial strain within the starter. One of my starters being the case. And while I believe it's not wanted in some beers it is in others such as Lambic Beers or Berlin Weissbier. The starter which has pediococcus as the main bacteria is healthy, strong and makes great tasting sourdough. Never had an issue with it. I believe you can rule this out. I think I was less than clear with the Pediococcus example. I just knew that was a thing in beer production and wanted a demo of what I think is a bacterial gum (that's an exopolysaccharide, right?) in action, since it resembles what I see in the starter. I was really just curious if anyone knew if that amount of gum was normal and we just don't notice it as much when the gluten is strong, or if this is abnormal in other ways. I've read that numerous species produce EPS so I don't mean to accuse poor Pediococcus here! Thanks, Debra, for clarifying the difference between breakdown and interference. I'm confused because I see the dough get weaker (and stickier) over time. Stirring and adding air doesn't seem to enhance the strength, although I would have to try again and pay more attention. In any case, it probably doesn't matter apart from being a curiosity given that the solution is probably the same regardless of the specific organism or cause of the problem. Thanks Debra. I followed your directions for restoring my starter to health, feeding it 3 times daily for 11 days. The bread that I made on day 11 was completely successful! Hurray! I must say that I was surprised because although my starter rose well each time I fed it, the sulfurous odor never went away and I didn't notice much change in the character of the starter, but the proof is in the pudding so to speak, and I'm thrilled to have made a good loaf. I'm working on loaf #2 as I write this. I'll try to keep my starter healthy by letting it rise each time I feed it before putting it back in the refrigerator. I'm glad to know that keeping only a small quantity of starter is OK, I hate waste. Many thanks for sharing your expertise! This is so very helpful! I have a rye starter and a white flour starter on the go and my white flour starter has recently started having issues. I just made a batch of "trial run" hot cross buns and the results were not happy. (incidentally, they tasted good...hope it was ok to eat them) I'm pretty sure thiols are my issue. So when I step up the feeding to try and get through this, when do I feed - as in, do I wait for the rise to peak? Or should I be feeding it 3 times a day no matter what it's doing? Disappointed about the ten days - I did so hope for sourdough hot cross buns for Good Friday! But if I can get the starter through this and back to health that would be great. Thanks again for all the helpful information! Sorry I missed this. You should let it rise at least partway before feeding again. If it isn't rising at all, drop back to once a day until it is. If it is rising, then adjust the feed rate as you go so that it will get to peak by the next scheduled feeding, without falling or only slightly receding. so valuable! i have this issue! question: how does one avoid this happening to one’s starter? This can happen when the natural order in a starter becomes unstable from a changing environment, be it intentional or from neglect. If you're making a deliberate change, you need to allow enough time for it to complete the transition and stabilize. Sometimes it only takes a few days and you won't notice any rheological problems. Or it could take a couple weeks and bread-making might be challenging in the interim. Degree of change and natural selection determine which. If it is the result of neglect or underfeeding, then you'll need to be more mindful and consistent in feeding and care. Consistent adequate care is what ensures a stable and dependable starter.